The iPhone is a multimedia and Internet-enabled quad-band GSM EDGE-supported mobile phone designed and sold by Apple Inc. The iPhone's functions include those of a camera phone and a portable media player ("iPod"), in addition to text messaging and visual voicemail. It also offers Internet services including e-mail, web browsing, and local Wi-Fi connectivity. User input is accomplished via a multi-touch screen with virtual keyboard and buttons. The iPhone has been available since June 29, 2007 in the United States from Apple retail and online stores, and from AT&T Mobility. It is currently offered for US$399 for an 8 GB model. Apple has released a video explaining many of iPhone's features through a series of demonstrations. The 3.5 in liquid crystal display (320×480 px at 160 ppi) HVGA touch screen topped with optical-quality, scratch-resistant glass is specifically created for use with a finger, or multiple fingers for multi-touch sensing. Because the screen is a capacitive touch screen, no stylus is needed, nor can one be used. The requirement for bare skin to be used has caused concerns for users in areas with winter climates; gloves worn would then have to be removed to use the touchpad. The user interface also features other visual effects, such as horizontally sliding sub-selections and co-selections from right and left, vertically sliding system menus from the bottom (e.g. favorites, keyboard), and menus and widgets that turn around to allow settings to be configured on their back sides. 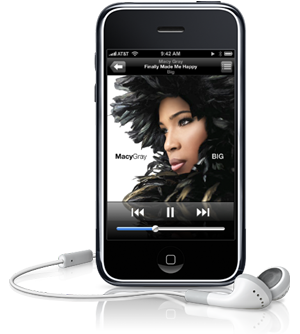 The iPhone's headphones are similar to those of current iPods, but also incorporate a microphone. Calls can be answered and ended by squeezing a bud, toggling the microphone. The 3.5 mm TRS connector for the headphones is located on the top left corner (as seen from front upright). Wireless earpieces that use Bluetooth technology to communicate with the iPhone are sold separately. The loudspeaker is used both for handsfree operations and media playback. For text input, the device implements a virtual keyboard on the touchscreen. It has automatic spell checking, predictive word capabilities, and a dynamic dictionary that learns new words. The predictive word capabilities have been integrated with the dynamic virtual keyboard so that users will not have to be extremely accurate when typing—i.e. touching the edges of the desired letter or nearby letters on the keyboard will be predictively corrected when possible. The keys are somewhat larger and spaced further apart when in landscape mode (currently, only using Safari). 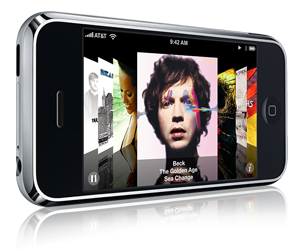 Reviewers, writers and analysts have pointed out several areas in which the iPhone falls short. The virtual keyboard has been considered its chief weakness and a risk for Apple. David Pogue of The New York Times and Walt Mossberg of The Wall Street Journal both tested the iPhone for two weeks and found learning to use it initially difficult, although eventually usable. Pogue stated use was "frustrating" and "text entry is not the iPhone’s strong suit" but Mossberg considered the keyboard a "nonissue." Both found that the typo-correcting feature of the iPhone was the key to using the virtual keyboard successfully. Scrolling through a long list works as if the list is pasted on the surface of a wheel: the wheel can be "spun" by sliding a finger over the display from bottom to top (or vice versa). After the finger is lifted from the display the wheel continues to "spin" for a short moment before coasting down. In this way, the iPhone seems to simulate the physics of a real object, which, it is thought, should give a natural feel to the whole process. The iPhone varies from common desktop interfaces by using a direct manipulation model of scrolling. Where a typical desktop GUI achieves scrolling by using a scroll-arrow to push a view-window down and thus the content itself up (or the reverse, clicking up to move content down), the iPhone interface enables the user to move the content itself up or down by a touch-drag-lift motion of the finger, much as one would slide a playing card across a table. Additionally, the speed desired for scrolling is computed based on the speed and acceleration with which the drag motion is performed. The photo album and web page magnifications are examples of multi-touch sensing. It is possible to zoom in and out of objects such as web pages and photos by respectively "unpinching" and "pinching" them, that is, placing two fingers (usually thumb and forefinger) on the screen and moving them farther apart or closer together as if stretching or squeezing the image. This scaling is done uniformly and proportionally based on the image in question so there is no distortion of the image itself, as would be the case if the image were actually stretched or squeezed. One disadvantage of multi-touch with regards to AJAX web sites is that there is no mechanism for right clicking on a UI element. That is, there are no separate paradigms for emulating certain functions of a multi-button mouse. However, 'hovering' over a UI element can still be achieved by touching and holding a UI element. The iPhone's touch interface has been compared by some media to the HTC Touch, which also features a touchscreen designed for fingers, although it can also be used with a stylus and lacks multi-touch. The display responds to three sensors: a proximity sensor that shuts off the display and touchscreen when the iPhone is brought near the face to save battery power and to prevent spurious inputs from the user's face and ears, an ambient light sensor that adjusts the display brightness which in turn saves battery power, and a 3-axis accelerometer, which senses the orientation of the phone and changes the screen accordingly. Web browsing and music playing support three orientations, while videos play in only one widescreen orientation. A single "home" hardware button below the display brings up the main menu. Subselections are made via the touchscreen. The iPhone utilizes a full-paged display, with context-specific submenus at the top and/or bottom of each page, sometimes depending on screen orientation. Detail pages display the equivalent of a "Back" button to go up one menu. The iPhone has three physical switches on its sides: sleep / wake, volume up / down, ringer on / off. All other multimedia and phone operations are done via the touch screen. Built-in rechargeable, non-removable battery with up to 8 hours of talk, 6 hours of internet use, 7 hours of video playback, and up to 24 hours of audio playback, lasting over 250 hours on standby. An analysis of the iPhone's firmware has revealed that the main Samsung chip (designated S5L8900) contains an ARM1176jzf processor, together with a PowerVR MBX 3D graphics co-processor. A separate dock is also available which charges both the iPhone and Apple Bluetooth Headset.
" Please tell me how much does iphone 4G cost in Iran ? " " man az norvej ye iphone 4 kharidam ba gheimate 500 toman age mishe gheimatesh too iran ro behem bgin,tanQ "
" alan gheimate iphone 4 too iran chande? " " Iphone 4g برای فروش 32g رنگ مشکی نو . دارای قفل ATT و ساخت امرئکا. version 4.1. با قیمت بسئار مناسب. بعد از خرید افن را در نزل دریافت کنئد. سفارش از تمام ایران. لطفن با ایمیل ctmhb@aol.com تماس بگیرید. خرید کلئ نیز موجود است. " " Iphone 4g- 32g برای فروش رنگ مشکی نو . دارای قفل ATT و ساخت امرئکا . version 4.1. با قیمت بسئار مناسب. بعد از خرید افن را در نزل دریافت کنئد. سفارش از تمام ایران. لطفن با ایمیل ctmhb@aol.com تماس بگیرید. خرید کلئ نیز موجود است. " " alan gheymate apple iphone 3g 16gb 840 tomane va modele 3gs 32 gb 1.200 hastesh "
" salam man nemitonam ax az internet chetor bayad berizam ro ghoshim "
" age mishe baram emil konid chon man nemiam to sait va gheymate in jadidash ke 3.2 "
" man apple mikham mitonam beporsam gheymatesh chande na azin asambele china aslesh male usa 3G "
" salam ,man barname unluke iphono mikham kasi dare lotf kone "
" mohsen the war bug "